With an unseemly Arenas Rule Point rating of 8, no NBA executive should consider Stephon Marbury as an addition to their team ever again. As I was writing Tuesday’s piece on why players leave Toronto’s sports teams, I began to toy with the idea of athletes who have moved from team to team, and came to the conclusion that there’s a point where any general manager should see a player’s team history as a red flag. I call this policy the Arenas Rule, after recently disgraced Washington Wizards star Gilbert Arenas who, thanks to his criminal gun charges, will likely be joining his third National Basketball Association team sometime this summer. Arenas Rule (also known as the Shaq Threshold) – Any athlete who has played for three or more franchises in their professional career is not worth signing as a free agent or trading for under any circumstances. The logic is simple. Although this former all-star might pay dividends when playing, they’re not worth the trouble off the court/ice/playing surface of your choice. It relies on the assumption that, like a first date who has to count off their exes on their fingers, they’re not worth the time or effort. Presumably, this veteran player has a nagging injury, is locker room poison, has an unwieldly contract, has lost a step due to age, is crazy or a combination of all of the above. Somehow, someway, they are damaged goods. Each team they play for adds an extra Arenas Rule Point on to their evaluation, increasing the risk of the move exploding in the GM’s face. Any athlete that has an ARP of 3 or higher is bad news and is going to severely damage the team’s chemistry, salary or reputation. Nash Caveat (also Seller’s Remorse) (ARP rating = 0) – Referring to NBA All-Star Steve Nash who was traded from the Phoenix Suns to the Dallas Mavericks only to re-sign with the Suns as a free agent, the Caveat stipulates that a player shall not have a second tenure with a team count against their ARP score. By all accounts, Nash is a not just a great player, but a great person. So likeable that even Canadians comment on how nice he is, the Suns welcomed him back with open arms, having regretted ever letting him get away. A player shouldn’t be punished for a GM’s hasty decision making. Millbury Allowance (ARP rating = -1) – Used judiciously, the Millbury Allowance forgives players who were traded in incredibly lopsided deals. An acknowledgment that not all GMs are created equal, the Allowance refers to former New York Islanders GM Mike Millbury who regularly traded away his best players for terrible returns. For example, Roberto Luongo is one of the best goalies active in the NHL today, but has an ARP rating of 3. He’s been moved from the Islanders to the Florida Panthers and then to the Vancouver Canucks. It’s not his fault that Millbury didn’t know what he had. The Millbury Allowance restores Luongo’s ARP rating to an acceptable 2. Davis/Trump Proviso (ARP rating = -1) - A team move, merger or a league’s collapse shall not count against a player’s ARP rating, as the extra teams listed on their resume were because of the financial and/or mental instability of the team or league’s leadership. Herschel Walker is one of the best running backs in National Football League history. However, he would have been the best running back in United States Football League history and led the New Jersey Generals to several championships, had the league not folded. Lindros Rider (ARP rating =+0.5) - If a player demands to be traded before their rookie training camp, an ARP point of 0.5 shall be added to their total score on the assumption that they are a budding prima donna. In his young career Eli Manning has already earned a 1.5 ARP because he refused to play for the San Diego Chargers. Instead, he was traded to the New York Giants. The demand should have been a warning to former Giants GM Tom Coughlin that Manning would suffer from erratic play, crippled by human emotions that his brother Peyton was not programmed with. David Beckham has earned an ARP rating of 6, having played for Manchester United, Preston North End, Real Madrid, the Los Angeles Galaxy (+2) and AC Milan. – Any athlete who has played professionally outside of North America will have an extra ARP assigned to their rating in addition to the standard penalty. Players will not be penalized for beginning their careers outside of North America. However, should they play more than 10 games in North America and then move to a professional league outside of the United States or Canada, the rule applies. If labour issues halt a North American league’s regular season, this rule is suspended for the duration of the work stoppage. NOTE: For soccer players, replace “North America” with “Europe”. What’s that? 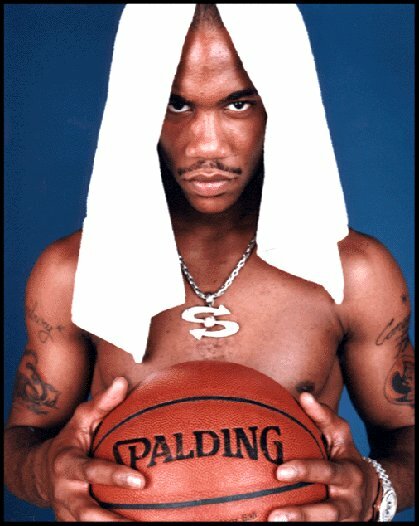 Stephon Marbury is the starting point guard with the Shanxi Zhongyu Brave Dragons? Yeah, you better believe that he’s crazy. Neon Deion Condition (ARP rating = x1.5) = Applies to any “two-sport” athlete who participates in more than one professional sports league in a single calendar year. Bo Jackson could’ve been a fantastic baseball player. Or a fantastic football player. He chose both. The decision cost the Los Angeles Raiders and Kansas City Royals an all-star because he required hip replacement surgery at the ripe old age of 28, when he should have been in his athletic prime. The Royals (or Raiders) should’ve turned him away the second they realized he was going to be playing in another league. The next time you hear that your favourite team is pursuing a veteran free agent or trading for a seasoned all-star, consider the Arenas Rule and do some math with the various stipulations. If you come up with an ARP of 3 or higher, you should be concerned. Everyone knew it was going to happen, but David Stern made it official Wednesday: Gilbert Arenas will be suspended for the rest of the National Basketball Association season. This was just days after Arenas pled guilty to a felony charge of carrying a pistol without a license stemming from an incident in the Verizon Center’s locker room on Dec. 21, 2009. Details are sketchy, but after an argument over gambling debts, Arenas’ Washington Wizards teammate Javaris Crittenton threatened to shoot Arenas in his surgically altered left knee. In response, Arenas allegedly laid out four handguns in front of Crittenton’s locker with a note inviting him to “Pick one”. Arenas’ guilty plea wil likely keep him out of prison, but the Wizards are strongly considering voiding the remainder of his $111 million contract. Although I whole-heartedly support the suspension and criminal prosecution of Arenas, I’m sorry to see one of the most entertaining players in the NBA absented for any period of time. It’s particularly disappointing as he'd just returned from serious injuries that had sidelined him for most of the 2008-09 season. Hibachi. Agent Zero. Whatever you want to call him, Arenas is one of the most entertaining players in the NBA. When he’s healthy he’s a dynamic scorers and playmaker, wrecking defences almost at will. Want an example? When he was snubbed by Team USA and left off their FIBA 2006 World Championship roster, he vowed revenge against assistant coaches Mike D’Antoni and Nate McMillan as well as Managing Director Jerry Colangelo. His retribution had nothing to do with firearms: he promised that he’d average 50 points per game against their NBA clubs. Sure enough, he scored 54 points against the Phoenix Suns (D’Antoni and Colangelo’s team at the time). Unfortunately, he faltered against McMillan’s Portland Trailblazers, scoring only nine points. It was a fun side-note to the World Championships, and all basketball fans could appreciate Arenas’ competitive drive. For a time, he took to yelling “HIBACHI!” after every made shot, because he was hot like the Japanese grill. That was one of the most appealing things about Arenas. He always seemed to appreciate the fact that he was paid millions of dollars a year to play basketball, a game he loves. 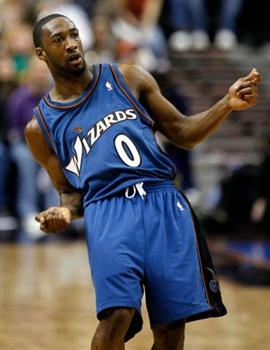 During the 2006-07season he donated $100 for every point he scored in Wizards home games. Team owner Abe Pollin matched the donations for every point Arenas scored on the road. He was the most accessible of professional athletes, quiet, down to earth and maybe even a little nerdy off the court. He is the official sponsor of Team Final Boss in Halo III competitions, and an avid player of the game himself, playing under the handle Agent Arenas. He was a regular blogger for NBA.com, until he found that it was too often a source of trouble for him. His quirky jokes and off-the-cuff remarks often motivated his opponents and got him in trouble with the media and coaches. Arenas often seemed childlike, even childish, and it backfired when he decided to tease a teammate with some of the samples from his gun collection as a joke about a gambling debt. Obviously, he didn’t know when to quit with his bizarre sense of humour. Arenas’ playfulness is going to be absent from the NBA for a long time now. When he returns to the league, it’ll probably be as a toned down, vanilla version of Agent Zero. The suspension and criminal charges are necessary, but NBA fans are going to sorely miss the Hibachi.